Get Ready to Run (& Play) in Seaside, Florida! March 1-3, 2019, the Seaside School Half Marathon, 5K and Taste of the Race with Chef Emeril Lagasse will be held! It is a 3-day event featuring amazing coastal cuisine, plenty of fun for all ages, and racing starting and finishing in the colorful neighborhood of Seaside. Whether you are a serious distance racer or a casual weekend runner, come join the fun and run in the 17th Annual Seaside School Half Marathon & 5K. If you’ve ever seen the Jim Carrey film, The Truman Show, then you have an idea of the kind of beautiful coastal architecture that you’ll find along the route at the annual race. The course takes runners on a long, straightaway-style out-and-back course along Highway 30A through several beach towns that stretch along Florida’s Gulf coast. Race weekend offers three days of exciting events for everyone including runners, visitors, locals and volunteers. Taste of the Race with Chef Emeril Lagasse kicks off the weekend on Friday evening under the tent at the Seaside Lyceum. Saturday’s Race Expo and Silent Auction is one big party with vendors, food and live entertainment all afternoon. Sunday is race day followed by a post-race party with live music. Friday March 1 – Seaside School Pre-Race Party | Taste of The Race! Sunday, March 3 – Race Day! 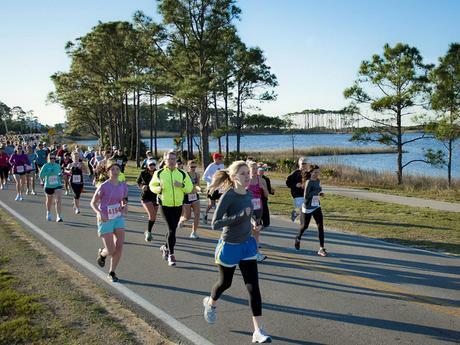 One of South Walton’s most popular events, the Seaside School Half Marathon & 5K takes place Sunday, March 3rd beginning at 7:00 AM. Established in 2003 to raise funds for the Seaside Neighborhood School, the Race has become a huge community affair, drawing in more than 4K annually runners from around the world. 100% of the race profits benefit the Seaside School, a tuition-free, local neighborhood charter school serving students who not only live along Highway 30A, but also across Walton County. The Seaside School opened in 1996 to 36 students, 2 faculty members and a single administrator serving students in sixth through eighth grades. Today, the school has expanded to fifth through twelfth grades, serving over 330 students with plans to add K4 through fourth in the near future. Have a question regarding your race registration, sponsorship or the Seaside School? Simply email [email protected] or visit the website at runseasidefl.com. Established in 2003 to raise funds for the Seaside Neighborhood School, the Seaside School Half Marathon & 5K as well as the Taste of the Race (with Chef Emeril Lagasse) has become a huge community affair, drawing in more than 4K annually runners from around the world. #runseasidefl in March 2019 byb registereing at www.runseasidefl.com.